My beautiful cottage provides ‘home from home’ comfort, and is conveniently situated within walking distance of the historic market town of Framlingham. With beautiful views of the castle, and the town centre a mere five minute walk away, the cottage is quaint and welcoming. 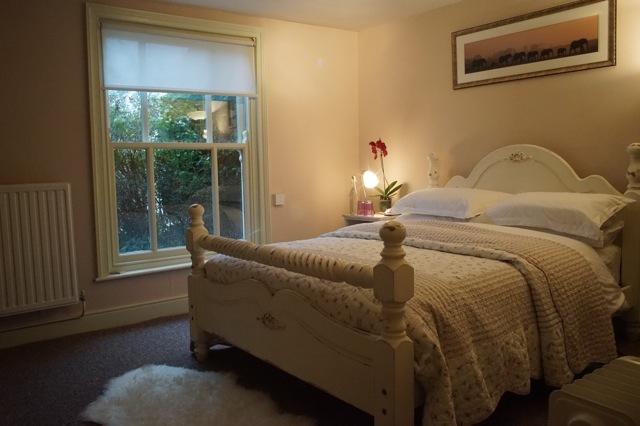 Two comfortably furnished double rooms, both ensuite, are warmly made available for visitors. Each room has its own T.V, wifi, and tea/coffee facilities. £95 per couple per night. After a sound night's sleep I offer a full home-made Suffolk Country Breakfast. Locally sourced sausages and bacon accompany eggs from my own free-range bantams. Framlingham is a beautiful market town situated in the heart of rural Suffolk. With a wide array of shops, pubs and eateries the town caters for your every need. The area is famed for its cultural significance and rich history. The seaside town of Aldeburgh is only 14 miles away and if you're looking for culture or shops, Snape Maltings is nearby and Woodbridge lies 11 miles to the South. Off-road parking is available for guests, along with a local bus service to town, and reliable taxis for those who are on foot. There are also two complimentary adult bicycles and helmets available for those wishing to explore the gorgeous countryside by bike.